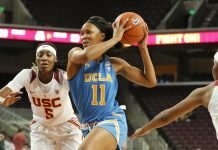 Those were the words of USC’s Aliyah Mazyck, shortly after the Trojans held on for a 47-44 win over Washington State in their Pac-12 Tournament opener on Thursday night. The win was USC’s 20th of the season, just a year removed from a sub-.500 season and a coaching change. Now, the team is on the cusp of its first NCAA Tournament appearance since 2014. Minyon Moore had 16 points to lead all scorers, with 14 from Aliyah Mazyck, while Nike McClure finished with a team-high 12 for the Cougars, 10 of which came in the final four-plus minutes. It was a defensive battle from start to finish, with both teams finishing the night shooting just over 30 percent from the field. Neither team led by more than four in the first half, with USC (20-10, 10-9) taking a 18-16 lead into the break after an offensively challenged first 20 minutes. The scoring picked up to an extent in the second half, but both sides were held under 50 points for the night, something that only happened twice for the Cougars (10-20, 3-15) and once for the Trojans during the regular season. All five USC starters played at least 34 minutes, four of them 38 or more, as the Washington State bench blanked the Trojans, 24-0. 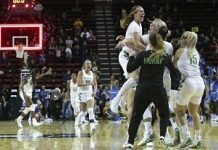 The loss caps what has been an often-difficult season for the Cougars, one made all the more trying by the sudden passing of strength and conditioning David Lang coach over the weekend. USC now takes on two-seed Stanford on Friday at 6 p.m. in the quarterfinals, a team the Trojans lost to twice this season, falling 72-65 in Palo Alto on Dec. 31, and 59-55 in Los Angeles on Jan. 19. · USC wins the season series with Washington State 2-0. In their lone regular season matchup, the Trojans came away with a one-point victory in Pullman, 73-72, on Jan. 26. · With the victory, USC hits the 20-win mark for the first time since the 2013-14 season, also the last time the team made the NCAA Tournament. 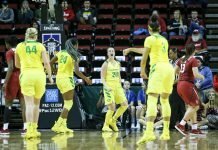 · Washington State’s three seniors — Krystle McKenzie, Caila Hailey, and Pinelopi Pavlopoulou — were honored before the game, after their Senior Night scheduled for last Sunday was cancelled. · Jordan Adams matched a season-high with 10 rebounds for USC.